Social Media Virgin: "The Twitter"
To be perfectly honest, I am not technically a virgin. I've fooled around a little here and there with social media, but I never made it past first base. That is all changing as our inbound marketing and social media team takes on the heroic task of giving me a "makeover" designed to help me dive in and get swimming in Twitter, optimized in LinkedIn, registered in Google+, and schooled in Facebook for business. As I wrote last week, I am jumping into the social media stream because I want to know more about the channels that get our content in front of prospects and I want to do my part to support our brand. As Creative Content Director, I enjoy the challenge of helping a client voice come alive through great branding, website copy, blogs, PR, and marketing assets. I love that we have a talented in-house team that manages and monitors social media for our company, but it’s past time for my coming-out party. So whether you are a C-Suite, Director, or Manager who wants to take the plunge, or you are a social media specialist needing to get management up and running, I invite you to follow along my rites of passage. When you hear older people talk about Twitter it often goes something like this..."I am not interested in "the Twitter." It is said with the same distaste as if they are talking about "the gout." Then the conversation shifts to the futility of twittering, twatting, or posting twits. It always makes me laugh and feel a tiny bit superior that I at least know that it's not the Twitter and that the correct terminology is tweeting and tweets. It's a good thing I have something to feel a little superior about because I am about to get schooled big time by our team and it is starting with the Twitter. 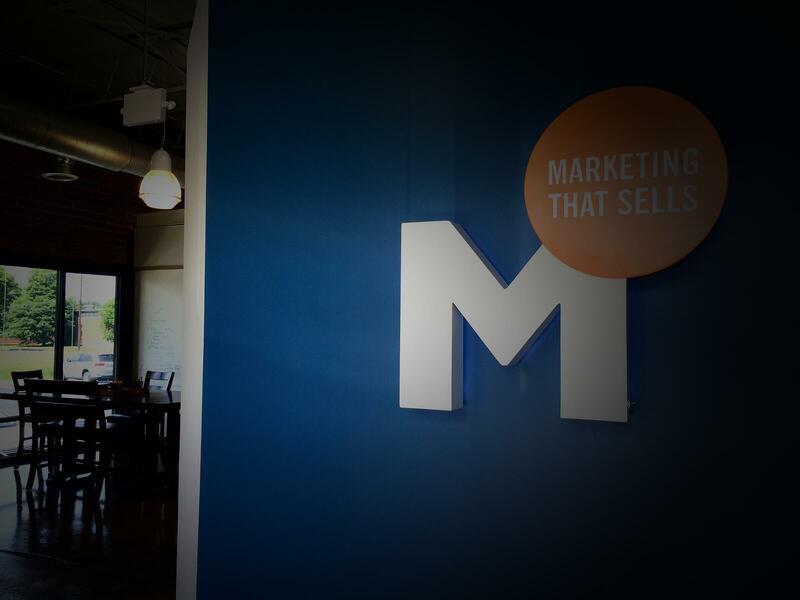 "Goodbye, happy ignorance," I tell Sydney Graham, one of our crack inbound marketing specialists. Big sigh. "More tasks to add to my calendar." Sydney replies calmly that I will be exploring a whole new world to make our brand - and my personal brand - that much more amazing and well known. With one succinct line about the reason to get on Twitter, Sydney has already begun schooling me. Twitter is a 24/7 conversation where each person speaks in 140 characters or less. Social Twitter can include a lot of "Here's what I had for breakfast" and other shared commentary on everyday life. Business Twitter is different. When I speak of Business Twitter, I am not talking about a company Twitter account (that’s “Company Twitter”). What I am talking about is using Twitter as an individual to build awareness of a company brand and your own personal brand. Business Twitter is about engaging with prospects and peers to share links to interesting content and to let followers know about important company developments like new products, media, and promotions. Step 1 - Go to twitter.com. The directions are user-friendly and they start with choosing a handle. The best choice for business is to use your real name. I do not have a unique name so that is not an option for me. 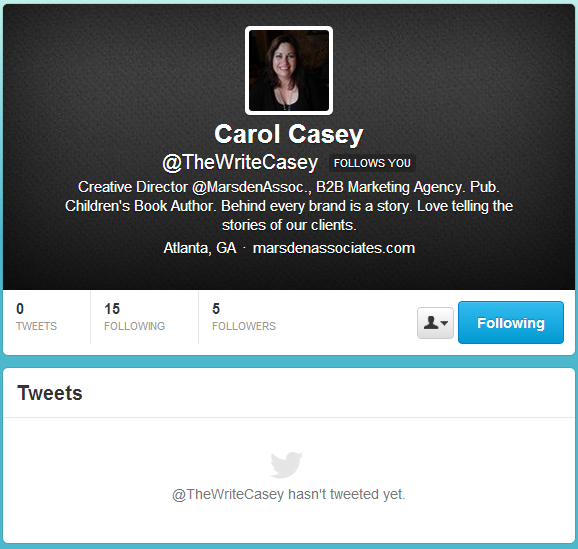 Many versions of Carol Casey are already on Twitter. After trying a couple of versions with numbers or abbreviations, I wonder how do people know they have found the right Casey? And there you have it: @thewritecasey. Next. This is often surprisingly hard for writers who spend most of their day writing about other companies and people. Check out the Twitter bios of people with similar jobs. Include the Twitter handle of your company in the bio. It creates a direct link to the company Twitter page. It’s okay to show a little personality by listing your passions or hobbies. Once you are confident about your tweeting schedule, add a line about how often people will be hearing from you. I limited myself to about 10 minutes and ended up making my bio very basic. I can always go back and fix it. The point is to respect the process and details, but not get mired in them. Next, upload a profile picture. The image needs to be less than 700 KB. Step 3 - Start following people on Twitter. Look at who your Followers follow. Chances are you will find some interesting people that you too can follow. You can skip steps at any point of the Following process, but it’s a good way to get started. Step 4 - Learn some basic business Twitter etiquette and best practices. Sydney uses a party analogy. You wouldn't go to a party and immediately start talking about yourself non-stop. Think of Twitter like an ongoing conversation where sometimes you listen and comment on other people's thoughts/suggestions/tweets. Remember this isn't Company Twitter. You are talking to other people with similar interests. Write your tweets like talking to people, not to other companies. Create a frequency schedule. Depending on your industry, strive to start out with 6-7 tweets a day. Follow the formula. The majority of your tweets should be link to other helpful related articles and resources to help your community.A good rule of thumb is the 10-4-1 rule. For every 15 tweets, 10 should link to other websites (not your own or associated with your company), 4 of them should link to your own content (blogs, videos, whitepapers, etc) and 1 should contain a call-to-action (blog subscriptions, form-fills, free trials, etc.). The goal of this formula: engagement. This may be challenging at first with only a few followers! Followers welcome @thewritecasey. Think before tweeting. Tweets live on. Don't say something inappropriate that can hurt you or your company. Don’t Tweet and Drive and Don’t Drink and Tweet – good rules to live by for any social media interactions! Step 5 - Own the hashtag. Hashtags are kind of like a topical search system so that people can quickly find tweets or content that interests them. And here is a key point about hashtags: Hashtags are the only way to get your tweets read by people who aren’t following you. If you’re trying to connect to a larger audience, you need to let them know you’re here with interesting things to contribute. The #hashtag is your ticket to getting found. Remember – the hashtag and word is included in the 140 total characters. For example #IBM or #SocialMedia quickly categorizes the content in your tweet. Step 6 - Start tweeting. There is so much more to learn and we will continue to talk about best practices, but information paralysis can quickly kill trying on a new skill. Use your common sense and get going. So it's into the abyss I go.